A bit late in the day, but at least I finally got to the computer. I’ve been gone from this site for a little over a month now. What have I been doing?! Some reorganization in the studio for one. Not an awful lot, but enough to make things a little easier for me. Both a problem and a good thing for me is that I am equally left and right brained. Organization is a must, but so is creativity. I now have most of my project boxes where I can clearly see them and it helps to keep me motivated. Will I ever reduce the number of project boxes? Not likely – there are many in the queue to refill the empty boxes with! 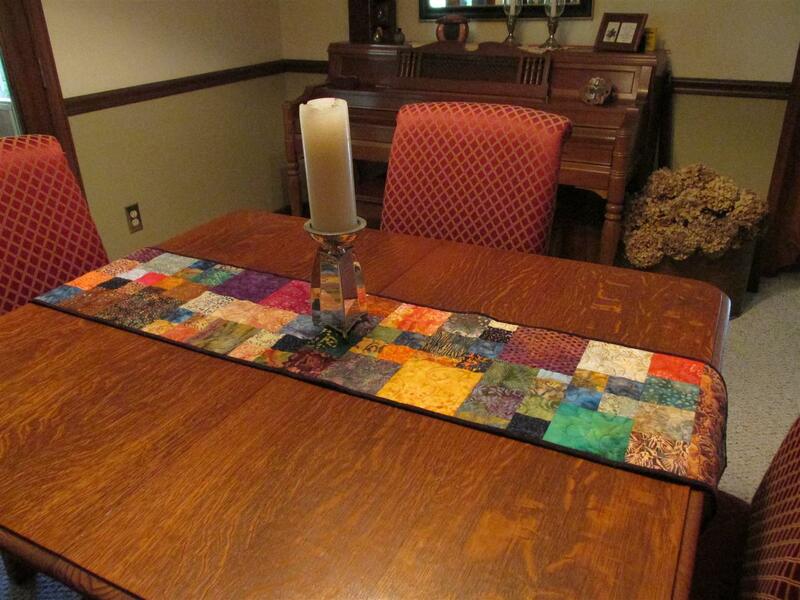 I do have a finished project to show – a reversible batik table runner. 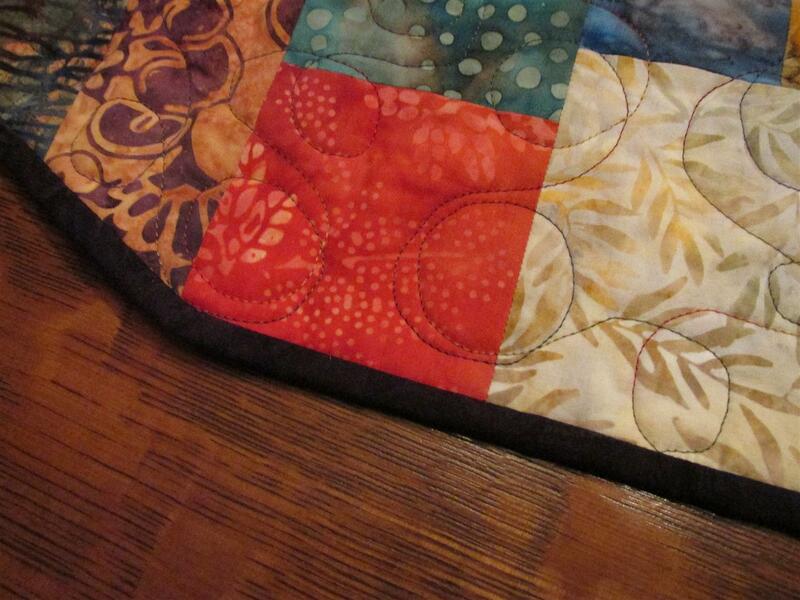 But no looking at the quilting – I used this piece for practice and much more practice is needed! When I did my Batik Bounty, there were several blocks left over. I put them together without sashing. 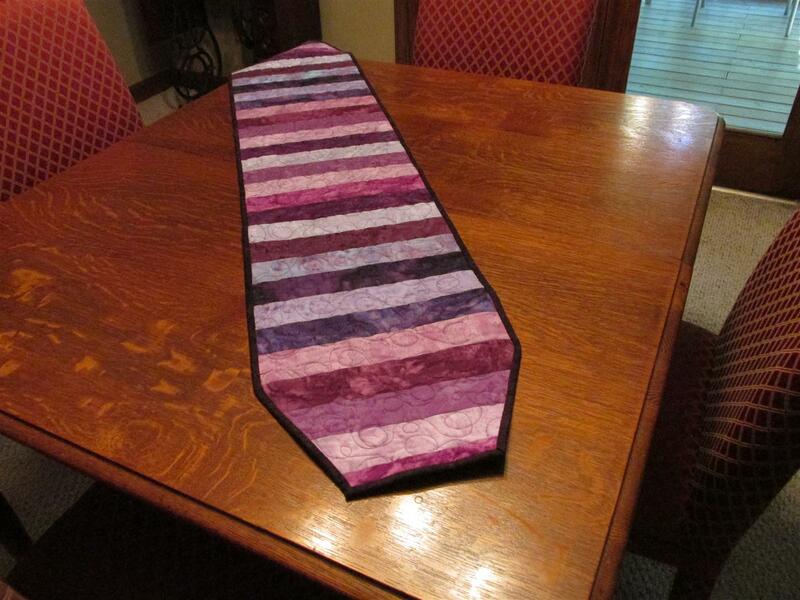 For the backing I chose strips from a purple batik strip roll I had in my stash. The binding was the real problem. It needed to be able to pull the front together and go well with the back. I did need to make a trip to the fabric store for this one. I chose a very, very dark purple that reads more like a solid than a batik. The results? I love it! This new finish graces the top of my antique oak dining table and adds a lot of style to the room. Almost made it using only stash, but not quite. Posted in Fabric, Quilting, Scraps, Stash and tagged batiks, Scraps, stash. Bookmark the permalink.